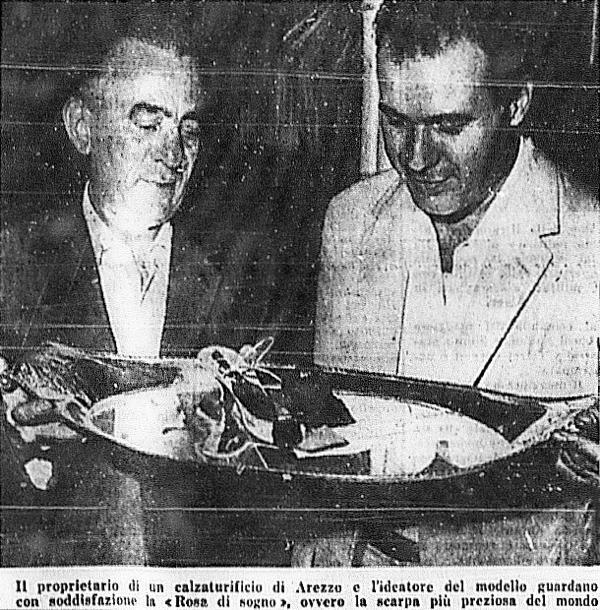 Salvatore Deodato's son, Michelangelo, started his search from a yellowing newspaper clipping without the date nor the name of the paper. His father made the most precious shoe in the world (for a while at least) and he wanted to know more. 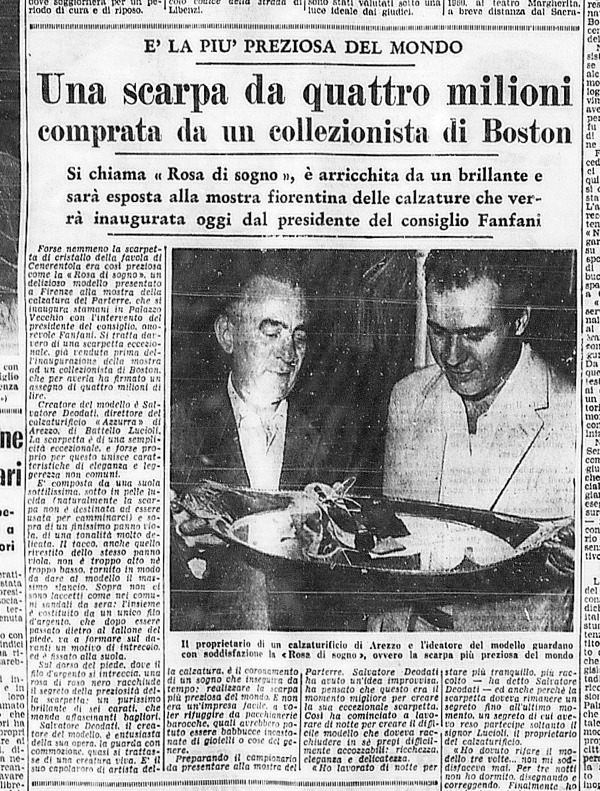 To make a long story short, after searching thru microfilms from three different major Italian newspapers he finally found it. That's Phase 1. Showcased at the 2nd Florence Footwear Exhibition at Palazzo Vecchio, the sandal called "Rosa di Sogno" got noticed by a Boston shoe buyer/collector the day before the grand opening and bought it on the spot. 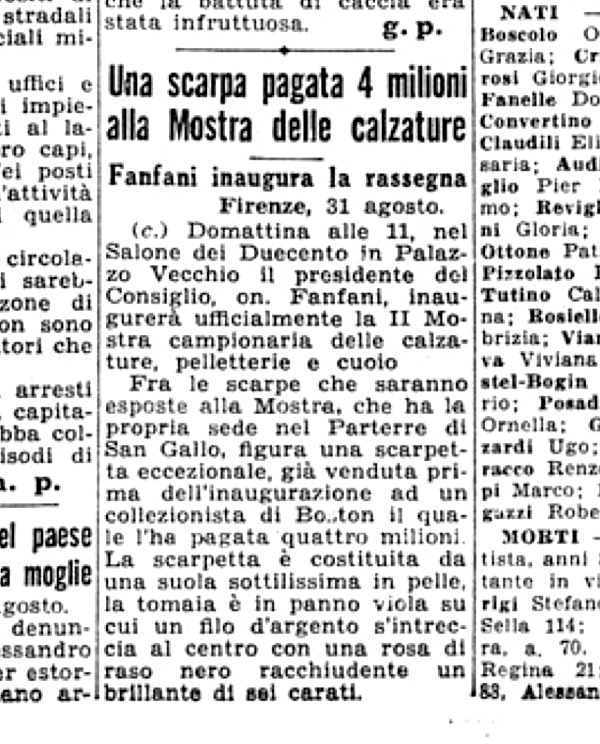 The news made headlines because of the astounding sell price: 4,000,000 liras (roughly, just short of € 50,000 today). The evening sandal sports a paper-thin black patented sole, purple cloth upper with a silver thread criss-crossing at the middle where a black satin rose hosts a 6 carat diamond. 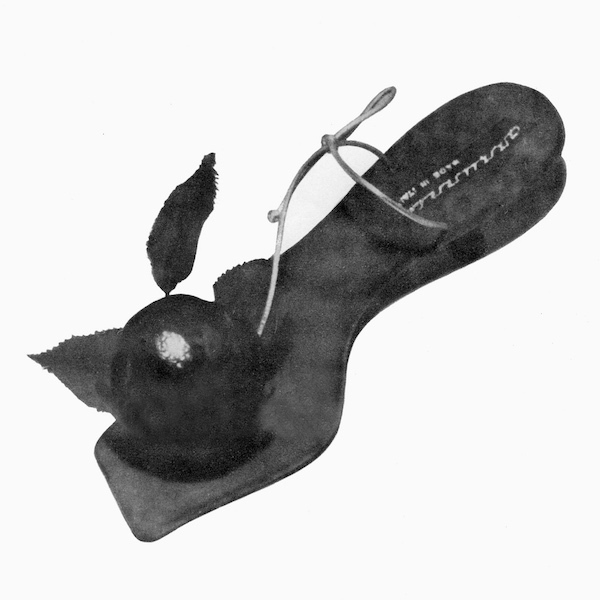 Salvatore Deodato designed the sandal (a sample, not a pair) for Arezzo's shoemaker Azzurra - owned by Mr. Battello Lucioli - where he served as both director and designer. Now Phase 2: Michelangelo Deodato would like to find the anonymous collector from Boston - or his heirs - in order to buy back the shoe. As far out as it seems, if you happen to know someone who know someone else PLEASE get in touch and we'll forward the info to Michelangelo.